Mindy Kaling is an author, a power shopper, an aspiring show runner and a "happy nerd"
Outside Office hours. Mindy Kaling is an author, a power shopper, an aspiring show runner and a "happy nerd"
Don't mind the lateral lisp, that slushy sound escaping around her s's and z's. 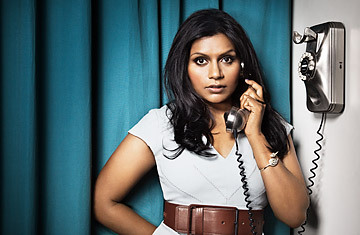 It's the plate tectonics of her mouth, Mindy Kaling explains. Her orthodontist told her that if she didn't get braces, her mandible and maxilla would continue to drift out of alignment until her jaw protruded forward, lending her an almost Neanderthaloid aspect. Which, if you think about it--and Kaling did--could have been sort of funny.